Hernia repair is one of the most common procedures performed worldwide. Laparoscopic hernia repair is established as a safe and effective technique. 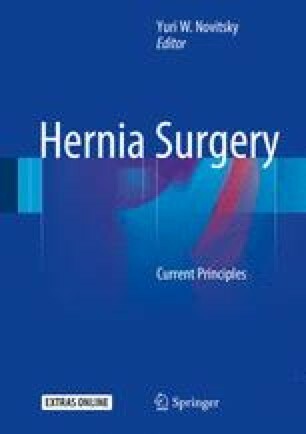 Currently, laparoscopic inguinal hernia repair is not only widely accepted, but in many cases, especially with recurrent hernia or bilateral inguinal hernia, this approach has become a method of choice and for selected patients with primary unilateral inguinal hernias as well. Two laparoscopic techniques for laparoscopic inguinal hernia repair are used currently: a totally extraperitoneal technique (TEP) and a transabdominal preperitoneal technique (TAPP). Each of the techniques has a different approach to the preperitoneal space but with similar repair techniques. It is very important to understand the preperitoneal anatomy to prevent technical complications. Overall, the data conclude that in experienced hands, that complication and recurrence rate is low with TAPP technique, but surgeons should tailor their surgical approach based on their experiences with laparoscopic hernia repair. The online version of this chapter (doi: 10.1007/978-3-319-27470-6_43) contains supplementary material, which is available to authorized users.